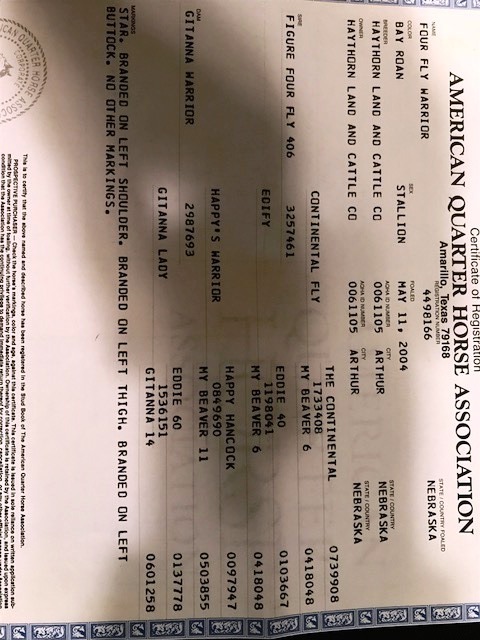 Deuce(Dual Smart Bell) will be my new versatility horse for the 2019 show season. 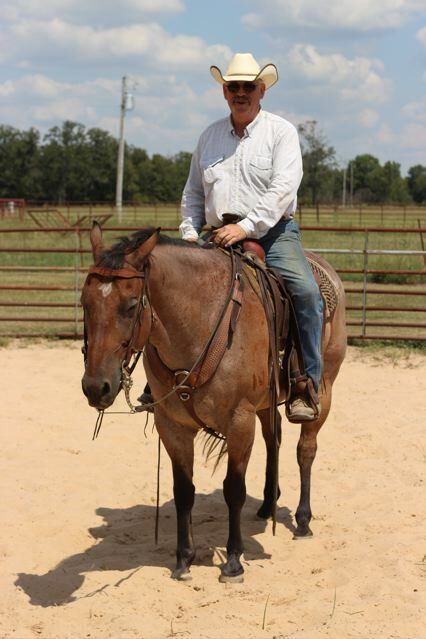 Steve Jones Horsemanship conducts multi discipline clinics and lessons for all levels of Horsemen. The basic concept in training is to teach the horse to SEEK the release from pressure. I want to apply a specific cue to a specific body part to get a specific response. I hold the cue until the horse finds the release. A phrase I use is “make the horse own it.” Another way to look at it is for the horse to take the responsibility to engage the thinking side of his brain. The Human responsibility is to not Micro-manage! 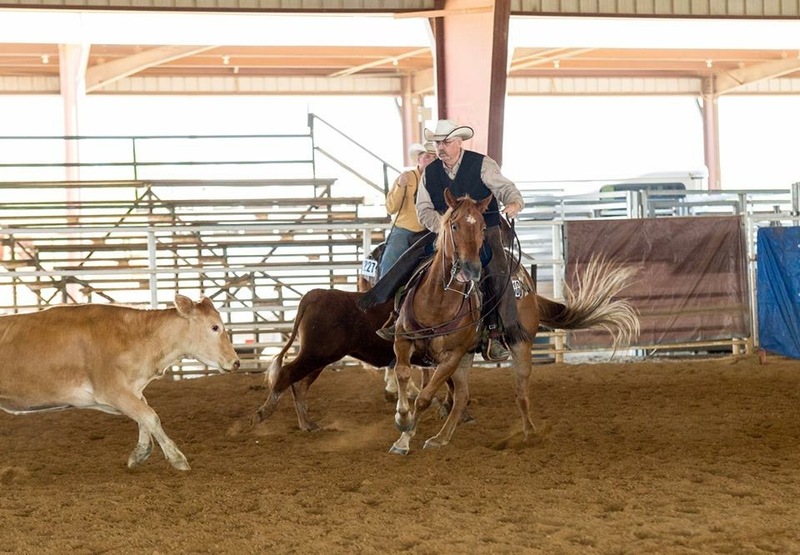 Apply the cue, allow the horse to find the release of pressure, release the pressure, and then correct them when they don’t hold the response (re-apply the cue). This approach allows you get more light with your cues and start putting combinations together. By seeking the release from pressure, the horse will perform desired maneuvers and be more consistent in doing them. I hope you all have a wonderful Christmas, enjoying family traditions or starting new ones! May you start your New Year with resolutions that will include becoming a better Horseman- your Horse will appreciate it! 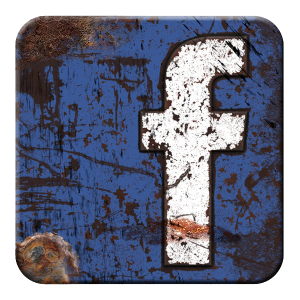 Feel is a concept, which is your responsibility as a rider to learn and develop. You need to learn to distinguish when your horse has responded and how to reward this. What feel means is the ability to tell when a change has happened with the horse; adjust and correct/reward the horse. Feel is more difficult for you to recognize than the horse! I struggle to teach FEEL. Truthfully, I struggle to develop the level of feel and timing I need to get the most from my horses! About the time I figure it out myself, a new horse, a new goal, a new obstacle arises that makes me doubt that I know. However, what I do know is teaching a repeatable foundation and sequence of cues to the horse will eventually allow the human to develop the proper feel, if they are observant. I try to assist horsemen in applying appropriate cues (the tool box of knowledge); knowing when the horse is responding; and how to reward that response. (1)Ask, (2) Suggest and if needed, (3) Demand the horse to try and then, (4) Release the pressure as soon as the horse responds positively. This may happen in Step 1, 2, or 3- but we must immediately release when the desired response is achieved. Also, we must always go through this sequence to get softness, responsiveness, and learning. Immediate response results when we anticipate a positive response, instead hoping for it. Exercises to improve a student’s ability to feel the movements and responses of the horse have been developed. They include the typical exercises for developing balance and independence of the hands and legs; feeling the horse’s foot falls and weight shifts; feeling the horse’s rhythm; and learning to respond to the minute responses of the horse. Developing balance and independent hands and legs is the most important to me. The objective of riding by feel is to be able to influence the horse. This can be done by simply establishing rhythm with the horse and then slightly changing the rhythm. As the horse becomes more receptive to your feel and rhythm, he will alter his rhythm to conform to yours. You can influence how long a horse’s leg is on the ground by simply putting more weight on that leg as it strikes the ground. By weighting a leg, the student can influence the horse’s speed, leads and responsiveness. By using your hands on the reins in rhythm with the horse, you can change the rhythm of the horse by simply slowing the rhythm of your hands. The same thing can be accomplished by slowing your weight shifts to influence the horse and his balance. Riding by feel is a difficult, challenging task. As horsemen develop their timing and rhythm, they will become better riders. As they improve their ability to feel and respond to the horse, the horse will improve. Just a reminder that I will be kicking off the Cow working clinic on Thursday. 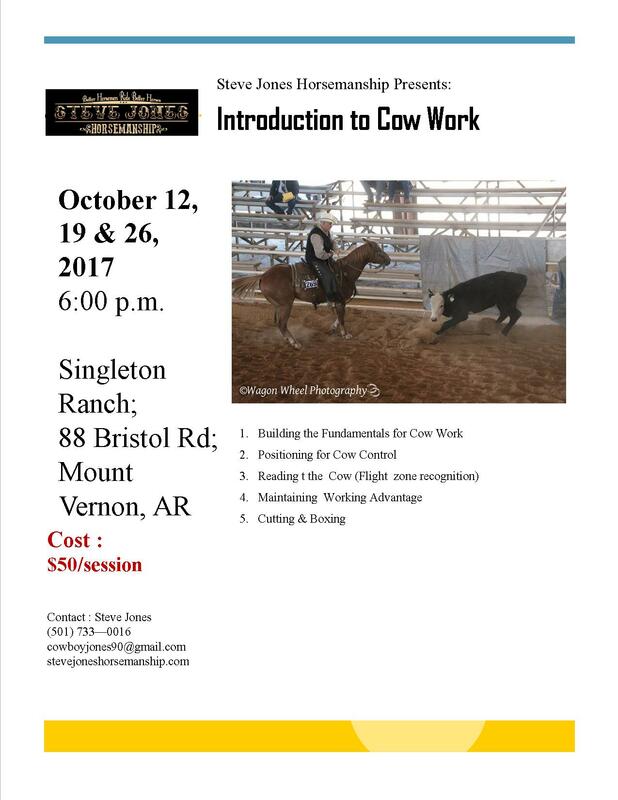 I will be conducting the Introduction to Cow Work Clinic series at Jerry and Alice Singletons(Mt. Vernon, AR) on October 12, 19 & 26; starting each evening at 6:00p.m. (earlier if you let me know). We have lights and will go as long as we need to. I will limit the registration to 10 per night. Come to one or all. Cost is $50.00 per session. I ask everyone to contact me so I can arrange for the appropriate number of cattle. Yes, we will work live cattle. We will also analyze correct stops; turns; and roll backs to maintain positioning on the cow. We will also spend some time on learning how to read the cow, positioning and control. Singleton Ranch; 88 Bristol Rd; Mount Vernon, AR Be careful with Google Maps- it sometimes send you the wrong way (opposite end of Bristol Rd) to get you there. Bristol road makes a loop off Highway 36. Spread the word- We are going to have fun on these cool October evenings. 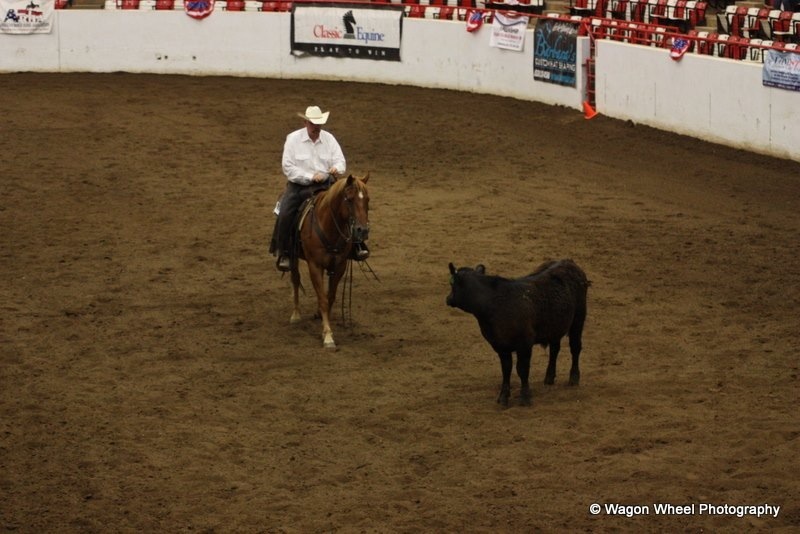 Have you ever thought about showing in cow horse classes? Or just want to have the experience of working a cow? Need to start a horse on cattle? 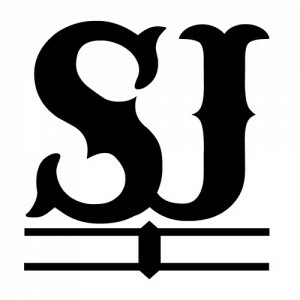 I will be conducting an Introduction to Cow Work Clinic series at Jerry and Alice Singletons(Mt. Vernon, AR) on October 12, 19 & 26; starting each evening at 6:00p.m. (earlier if you let me know). We have lights and will go as long as we need to. I will limit the registration to 10 per night. Come to one or all. Cost is $50.00 per session. I ask everyone to contact me so I can arrange for the appropriate number of cattle. Yes, we will work live cattle. We will also analyze correct stops; turns; and roll backs to maintain positioning on the cow. We will also spend some time on learning how to read the cow, positioning and control. He stands 15.1 hands and weighs about 1250. Bred by AQHA Best of the Remuda Award recipient, Haythorn Land and Cattle Company. I bought him at the Haythorn Production Sale in 2005. He has not left my possession since then. 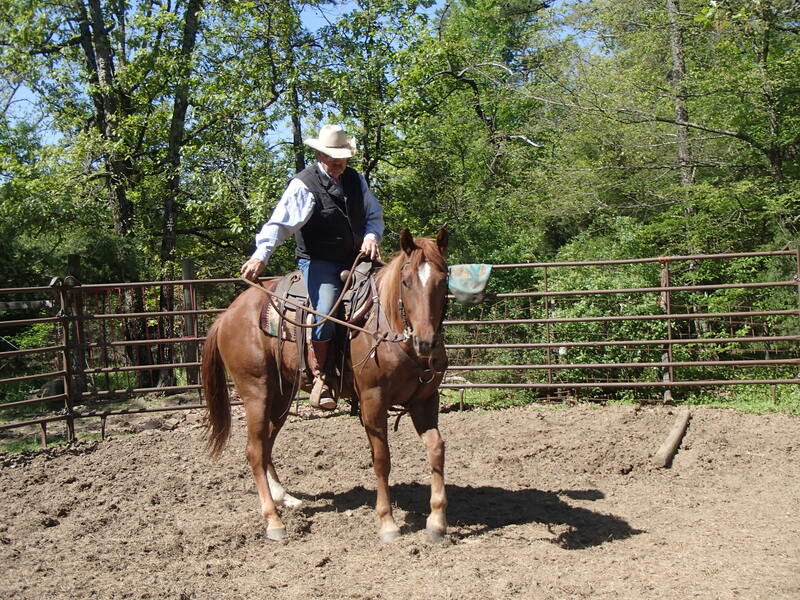 I have a young String I’m training now and Cheyenne is not getting rode much. So I’m offering him for sale so someone else can enjoy him. 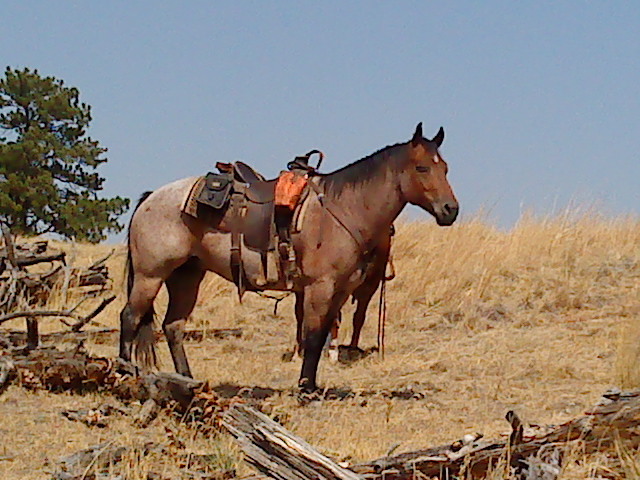 He is an experienced trail horse deluxe. 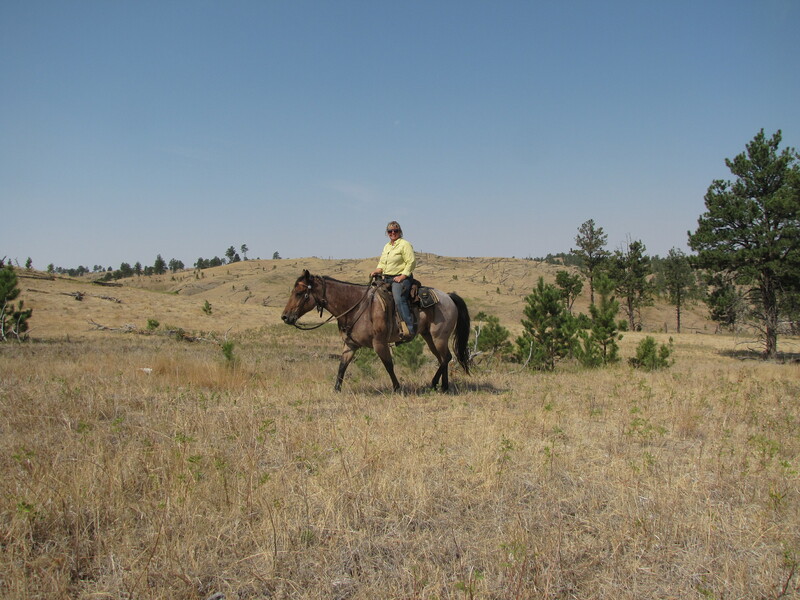 He has carried me and others all over the Ozarks, Rocky Mountains, Western Prairie and the Sand hills of Nebraska. 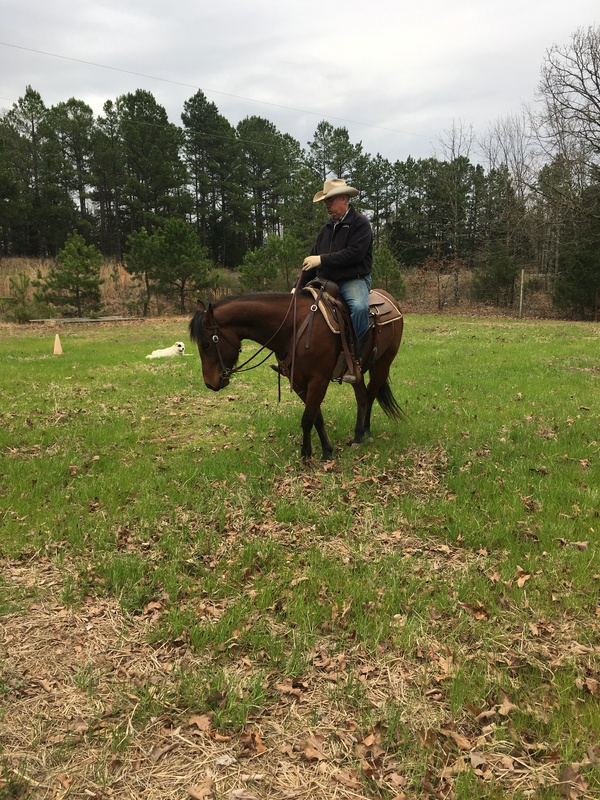 He’s gentle, easy to catch, doesn’t get excited about much and loves attention.You can turn him out for six months; catch him up; circle him a couple of times on the lead line; tack up and ride him off. Fact: turned him out mid-December and caught him up in mid-June. I rode him for about 30 minutes and put a beginner adult rider on him for the next 3 hours without incident. When Cheyenne is legged up and in shape, he has lots of stamina. He’s hobble broke; stands tied on a high line; eats from hay and feed bags; and travels well. I’ve used him often for clinics and demonstrations. He responds to body cues- gait transitions; turns; side-passes; two-tracks; stop and back of of leg pressure. No need to pull on his face. If it doesn’t feel right to him, he just stops. He has been used on a variety of Ranch Work as well. He has sorted lots of cattle in the pens for health work and loading trucks. 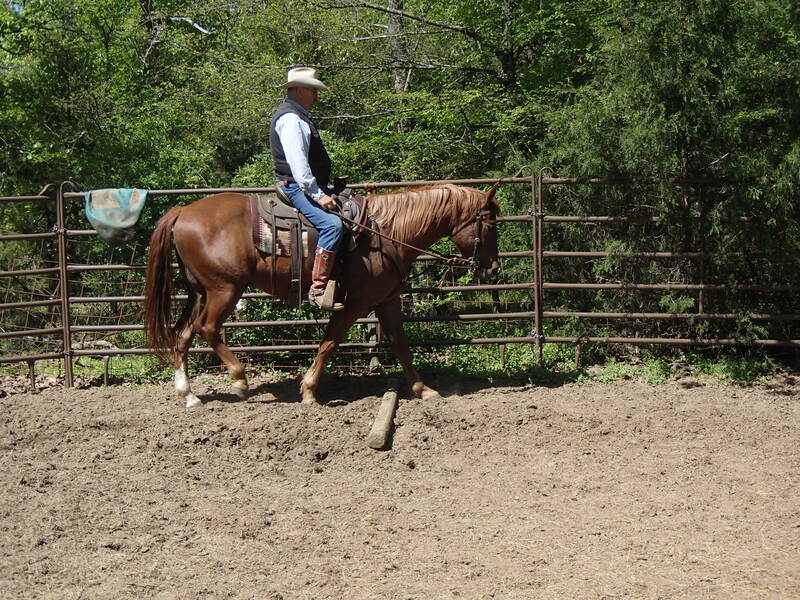 He’s the best calf dragging horse I’ve ever rode(if you have a need for such). Calm in the herd; picks his way around the herd and out with calf without exciting the bunch or himself. 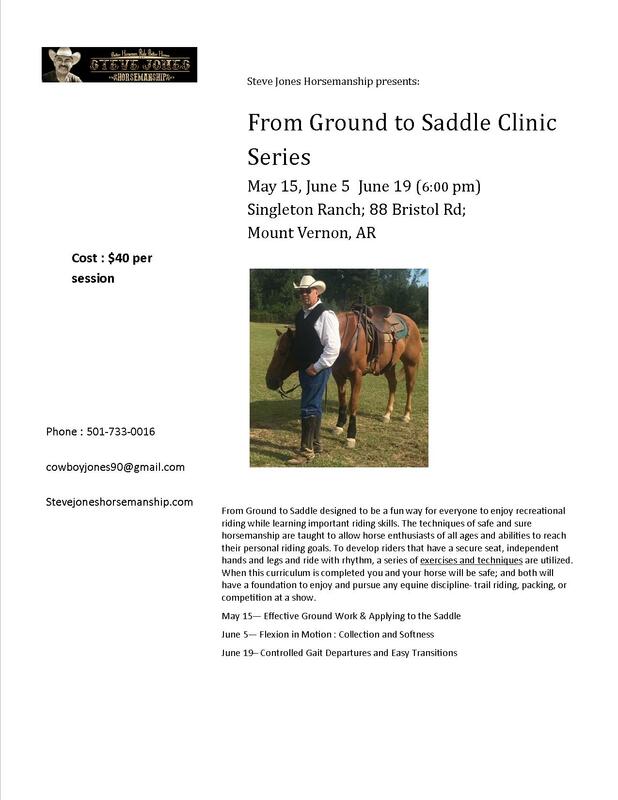 June 19 we will conducting part 2 of the Ground to Saddle Series..